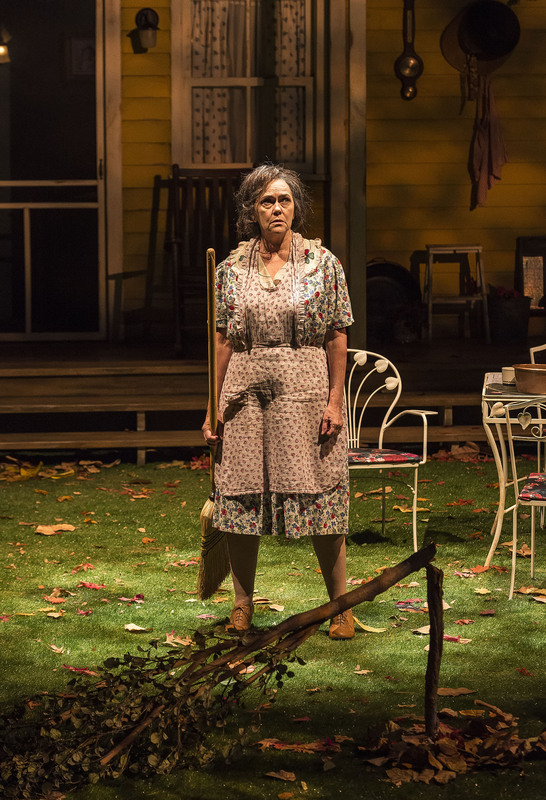 Frederica Nascimento’s lived-in scenic design for the current production might show a Middle American back yard surrounded by a white picket fence, but the playwright has wrought a tragedy worthy of the Ancient Greeks to play upon that stage. 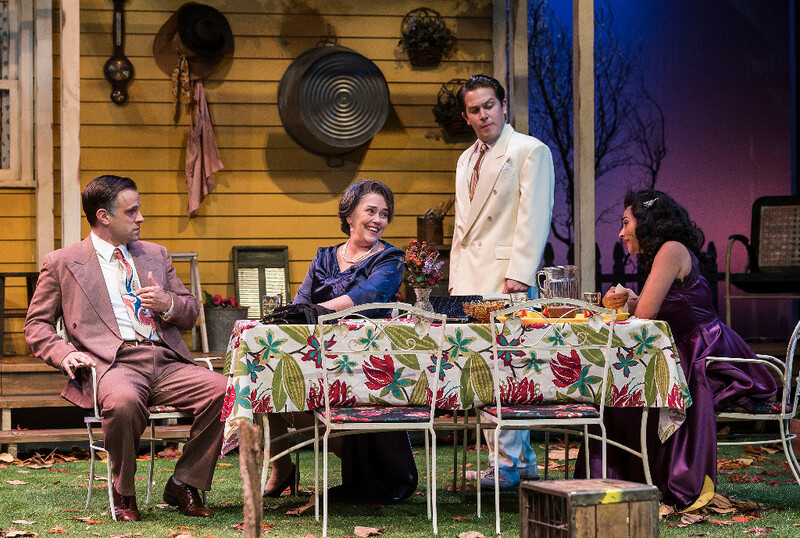 It’s a family drama, but also an indictment of the greed of American business, written 60 years ago. 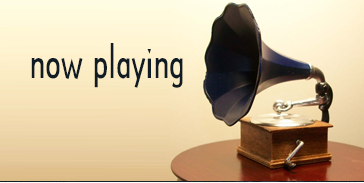 Joe Keller (Geoff Elliott) is a successful businessman in 1946 with his plant back to peace time production. There is a black cloud that hangs over the Keller family, an incident that happened at the height of the recently ended World War II. The Keller plant produced cylinder heads for air force planes but a fault in the process early on produced cracked cylinders that were still shipped, resulting in the death of 21 pilots. Keller and his business partner, Deever, were put on trial. Keller was later exonerated by a jury because of his alibi of being home sick the day of the fateful shipment. His former partner and neighbor is still serving his jail sentence. Joe makes light of his jail time with the neighborhood kids, handing out phony police badges and telling him he has a jail cell in his basement. 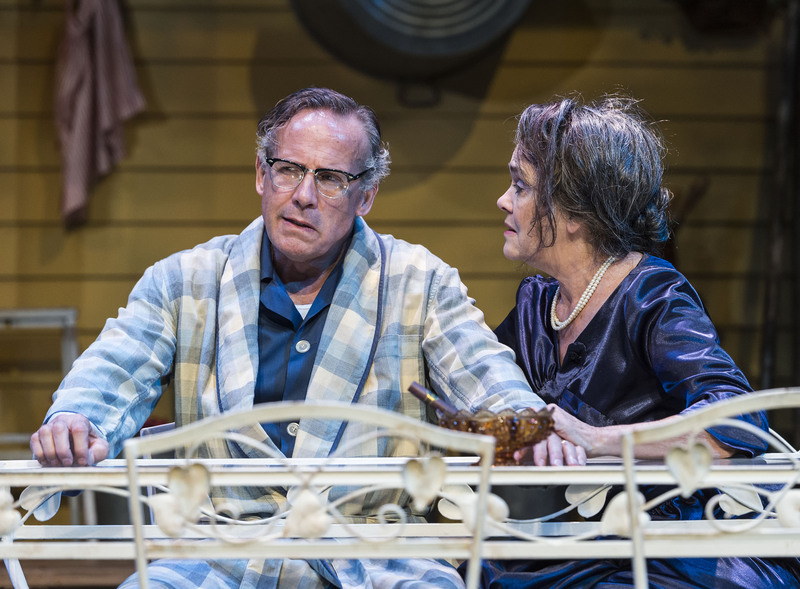 His wife Kate (Deborah Strang) disapproves but she goes along with it because Joe goes along with her steadfast belief that their pilot son is still alive three years after his plane went down in the Pacific. It’s been a long three years and the Deever family had moved to New York to escape the scandal of the patriarch. On this fateful day, Ann Deever (Maegan McConnell) has come for a visit. 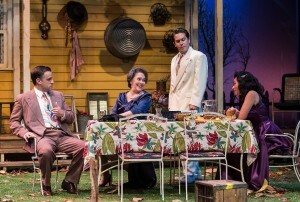 She was supposed to marry the elder son, but it’s the younger son, Chris (Rafael Goldstein) who has asked Ann to visit in the hopes of proposing marriage. Ann is soon followed by her older brother George (Aaron Blakely) who has visited his dad in prison for the first time and wants to confront the Kellers with the information his father has given him. No more spoilers will be given in this review. Feel safe to read on but see the play and experience the emotions that slowly build to a crashing crescendo under director Geoff Elliott’s tight direction. The cast is uniformly excellent. Besides those mentioned above, June Carryl proves to be a firecracker as Sue Bayliss, neighbor and wife of a doctor who doesn’t pay enough attention to his wife or his patients that pay his fee. If this were a Greek Tragedy, the role of Kate would be the supreme tragic figure. She’s not a doomed heroine like Antigone or Iphegenia nor is she a vengeful villainess like Medea. Instead of killing her children, Kate fights to keep them alive and perfect in the dream life she hoped for them to have. I have seen Ms. Strang in numerous productions over the years—she once stated she had three Robby Award nominations in one year yet didn’t get to take a trophy home. Being out of town for ten years I’m sure I missed a lot of other award worthy performances and she will undoubtedly have more in the future. But for this viewer, her performance here is her crowning achievement. If this were an opera or even a musical, the audience would be shouting “Brava, Diva” when she takes her curtain call. 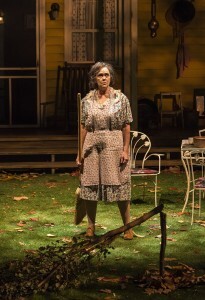 The play may be entitled All My Sons, but with Ms. Strang on stage, it’s all about the mother. A Noise Within, 3352 E. Foothill Blvd. in Pasadena. In repertory ending Nov. 21. www.anoisewithin.org or 626-356-3100 ex 1.